Oh my goodness, I'm so sorry! This announcement was supposed to be up on Sunday, but Blogger hasn't been letting me post the last couple of days. 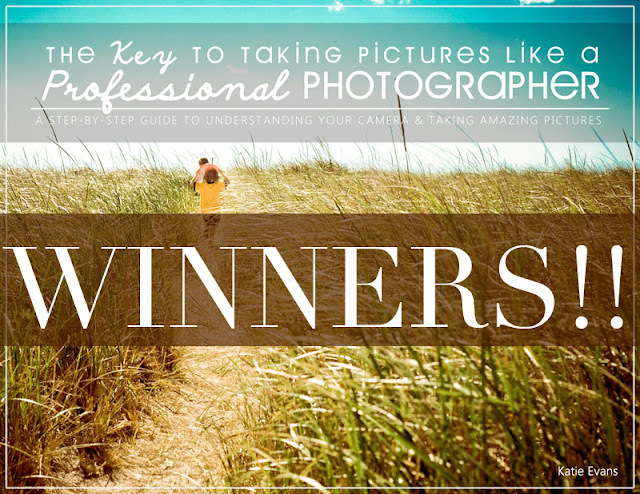 So I'm sorry that I made you wait an extra while, but......here are the winners of our giveaway of Katie Evans' E-book, "The Key to Taking Pictures Like a Professional Photographer"!! Congratulations, ladies! I'll be sending your email addresses to Katie shortly. Didn't win? Don't forget that you can still get a $2 discount on the e-book until May 8th by using the code: RUFFLES at the checkout! So go grab one HERE! See you tomorrow with a little something pink. I feel like a little kid hehe.